Dr. Janet Maker, Ph.D. is a breast cancer survivor who was diagnosed in 2011, and is also the author of The Thinking Woman’s Guide to Breast Cancer: Take Charge of Your Recover and Remission, which chronicles her own experiences, helps patients find the information they need to make the best decisions about their own treatment, and the best ways to stay in remission. In the United States, food is contaminated with pesticides, herbicides, chemical fertilizers, GMOs, antibiotics, hormones and other drugs, and sometimes irradiation. Buy organic, which means it was produced without conventional pesticides and herbicides, synthetic fertilizers, GMOs, or ionizing radiation, all of which contain known and suspected carcinogens. How to protect yourself: Organic meat, dairy and eggs come from animals that were not given antibiotics or growth hormones. There is a complicated labeling system which includes organic, humanely raised, GMO-free, grass fed, and cage free. It’s worth taking the time to understand the labels, which can be confusing and sometimes misleading. There is a good explanation by Consumer Reports here. We are supposed to be protected by the Clean Water Act, but in 2000, Erin Brokovich revealed that there are carcinogens in our water supply. The one she found is hexavalent chromium, which has since been found in 42 states. Other contaminants in water include fluids from fracking, acid rain, industrial waste, agricultural runoff such as pesticides, herbicides and fertilizer, and prescription and OTC drugs. In addition, some potential carcinogens, like chlorine and fluoride, are added intentionally. EPA testing is not adequate: it only tests a very limited range of known contaminants, and the research on safe levels and combinations of contaminants is also poor. Learn what’s in your tap water. Buy a water filter, and use filtered tap water for drinking and cooking. Change your filters on time, otherwise they don’t work. Drink filtered tap water instead of bottled water. Most bottled water i just filtered tap water that costs between 500 and 3000 times more than tap water. Also, plastic bottles contain toxins that are harmful to humans and the environment. Carry water in safe bottles, Use glass or stainless steel, not plastic. Pregnant women should stay hydrated with safe water. This is because rapidly dividing cells are much more vulnerable to carcinogens and other toxins. Infant formula should be prepared with safe water, because infants and children have rapidly dividing cells. Use a whole house water filter. Toxins can be absorbed through the skin as well as by drinking. The two chemicals considered the most dangerous are BPA and phthalates. They are associated with breast and prostate cancers and many other diseases. BPA also occurs in the linings of many cans. There are now some BPA-free plastics, but research on them has shown that almost all of them leached dangerous chemicals, including those advertised as BPA-free. In some cases, BPA-free products released more toxins than did BPA-containing products. In 2005, the EPA found that a chemical called PFOA was a likely human carcinogen, and it was the main ingredient in making Teflon, the non-stick coating used on kitchenware. It was also used in food packaging for greasy items like microwave popcorn bags, pizza boces, and wraps for French fries. Manufacturers promised to replace the PFOA by 2015, but EWG testing found that the replacements were no safer. Another dangerous product is aluminum cookware. Aluminum crosses the blood-brain barrier and has been found in the brains of Alzheimer’s patients. How to protect yourself: Avoid non-stick coating on pots, pans, bakeware, utensils and appliances. There are some new ceramic non-stick coatings that are apparently non-toxic, but check them out thoroughly. Avoid aluminum. The safest kitchenware is glass, ceramic, stainless steel and cast iron. Many people think the skin is a barrier, but because of its pores, it’s really more like a screen. Chemicals on your skin or scalp are absorbed directly into the bloodstream without any filtering. Toxins are in everything: makeup; products for skin, hair, teeth and nails; sunscreens; fragrance; including products for babies and men. How to protect yourself: Switch to non-toxic products. EWG has developed the EWG Verified mark that you can use to recognize safe products. You can also use the EWG Skin Deep Database, which reviews almost 70,000 products for safety. There are known or suspected carcinogens in nearly all household cleaning products. They are hard to check because cleaning products are not required to list their ingredients on the package and they are also allowed to use deceptive words like safe, non-toxic, green and bio-degradable that are completely false. How to protect yourself: Some state and local governments have been passing laws to protect consumers by requiring disclosures of hazardous ingredients or warning labels. In 2015, the EPA started the Safer Choice Program to screen for carcinogens and other toxins, and approximately 2000 products now carry the Safer Choice mark. Other reliable marks are Green Seal, Greenguard, ECOLOGO, and EWG Verified is coming soon. EWG also has a Guide to Healthy Cleaning, which reviews 2500 products. Finally, you can make your own non-toxic cleaning products using recipes found online. Chemical pesticides, herbicides and fertilizer all contain known or suspected carcinogens that can be absorbed through the skin or by inhaling sprays, dusts or vapors. They are especially dangerous to children and pets, and they are also harmful for the environment. How to protect yourself: Use natural, non-toxic pesticides, herbicides and fertilizers. Planet Natural is a great resource for learning about organic gardening and non-toxic products, and it gives you some steps that make it easier to transition from conventional to organic gardening gradually, one step at a time. We absorb toxins through our skin, so we need to be careful, not only about clothing, but also about sheets and towels, tampons, etc. 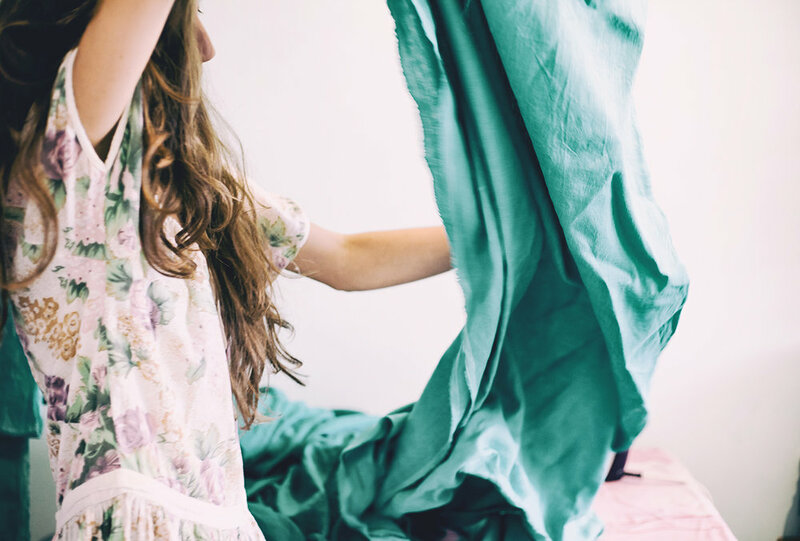 The top six toxic fabrics to avoid: polyester, acrylic, rayon, acetate and triacetate, nylon, and anything static resistant, stain resistant, permanent press, wrinkle-free, or moth repellent. Many of the stain resistant and wrinkle-free fabrics are treated with perfluorinated chemicals like those used in Teflon. How to protect yourself: Look for natural fibers like cotton, linen, silk, wool, hemp and cashmere. Viscose and lyocell (trade name Tencel) from from trees, and bamboo does not have pesticides and chemicals. Although natural fibers are usually better, they can also have pesticides and herbicides if they are not organic. Buy organic sheets and clothing, if possible. Avoid dry cleaning and wash clothes with a “green” detergent. In conclusion, it may seem like an overwhelming task to avoid all the environmental carcinogens, but I can attest to the fact that if you take it one step at a time, you can make big changes with minimal stress. And you will have the satisfaction of knowing that you are dong what you can to protect yourself and your family.